Japanese Tea Story : What's Wakocha like??? I wrote about a wakocha event on my previous post. You may be interested in what they are like. Well, that’s difficult to describe it because there are so many, but roughly speaking, I think the tea can be divided into three different types. 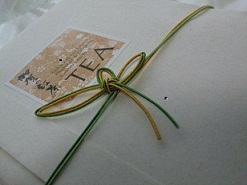 Made of same varieties as green tea including yabukita, sayamakaori and okumidori. Those varieties have less tannin, creating very mild taste, slightly sweet aroma and umami flavor. New types of varieties and hybrid are often used to create flowery and refreshing aroma. The hybrid between Chinese variety and Assam variety with more tannin are often used to produce more oomph than the other wakocha. The varieties like benihomare and benifuki give coppery red liquor with a good body. This is just from my experience, not based on scientifically evidence, but some wakocha remains good taste even when cold. Some get better. The tea color also remains without becoming cloudy known as "creaming down" maybe it's because the variety has less tannin. I've tried a lot so far, but wakocha still happily surprise me once in a while. .
"Kaga no Kocha" born in Kanazawa where the event was held this year. The knot represents "isshin-niyo (one bud and two leaves)"